From coast to coast, our Stylists share the inside scoop on how they incorporate go-to pieces in their wardrobes to create looks that are as captivating as they are fun (and versatile). From Cali eclecticism to East Coast elegance, keep reading to find out how real Stylists dress and to discover tips you can borrow from their secret arsenal of effortless style. “We don’t see any harsh winters or summers in the Bay Area, but the climate can be unpredictable. No matter the time of year, our wardrobe must include layers—especially when our infamous fog rolls in. When it comes to layering, my trusty denim jacket never fails to complete a look. 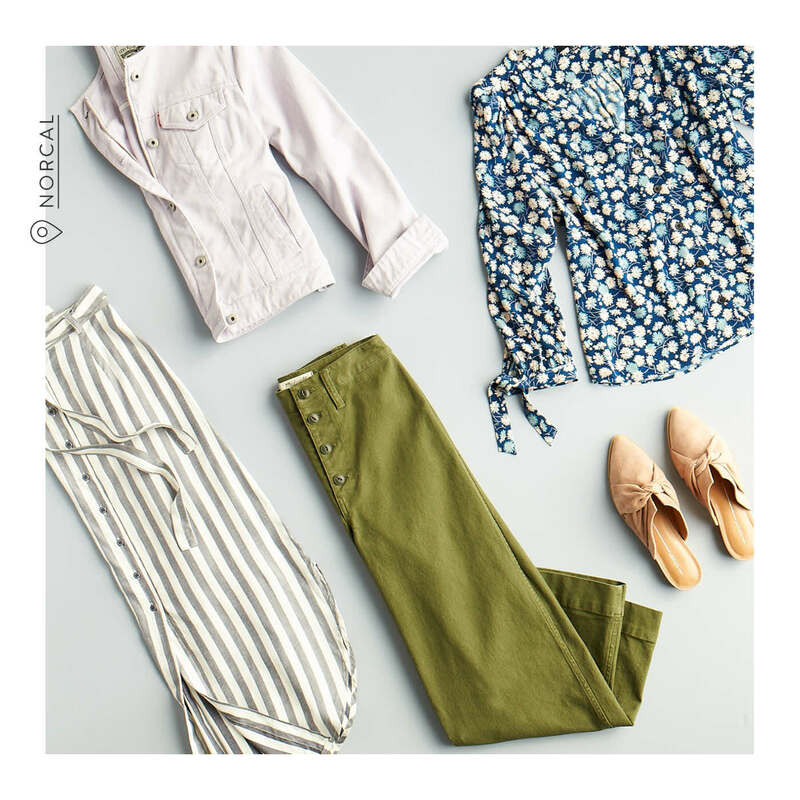 As soon as spring begins, I opt for a lighter wash as a nod to the season transition—and I wear it with flowy blouses and slinky dresses for added material contrast.” — Stylist, Crista G.
“Style in SoCal calls for eclectic prints and bright hues that match our sunny skies, plus a healthy dose of athleisure to score that chic “cool girl” aesthetic. 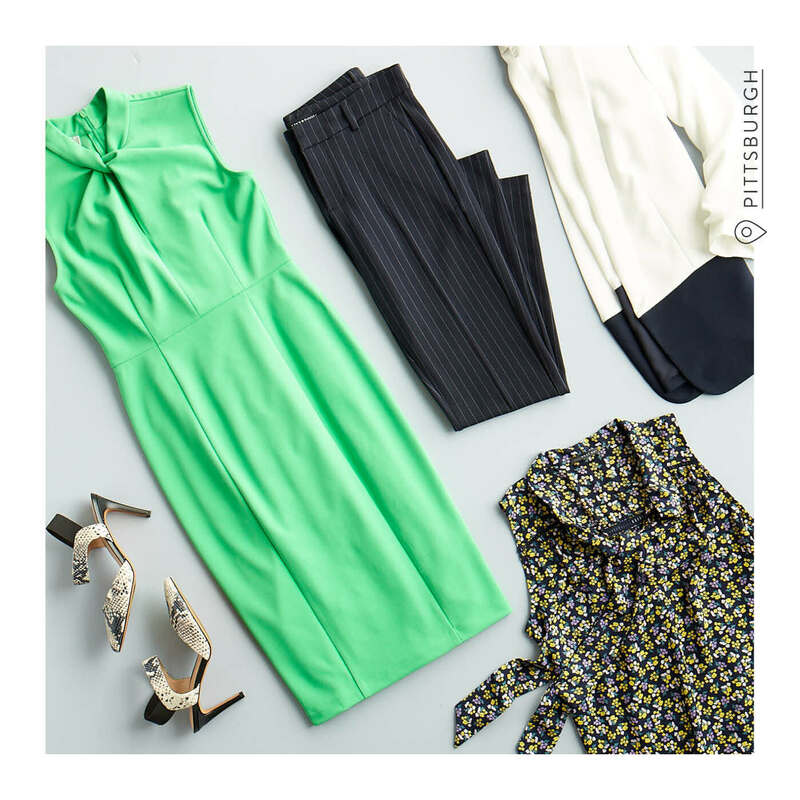 Yes, we love our glam Oscar gowns, but for everyday wear, it’s more about looking effortlessly put-together. 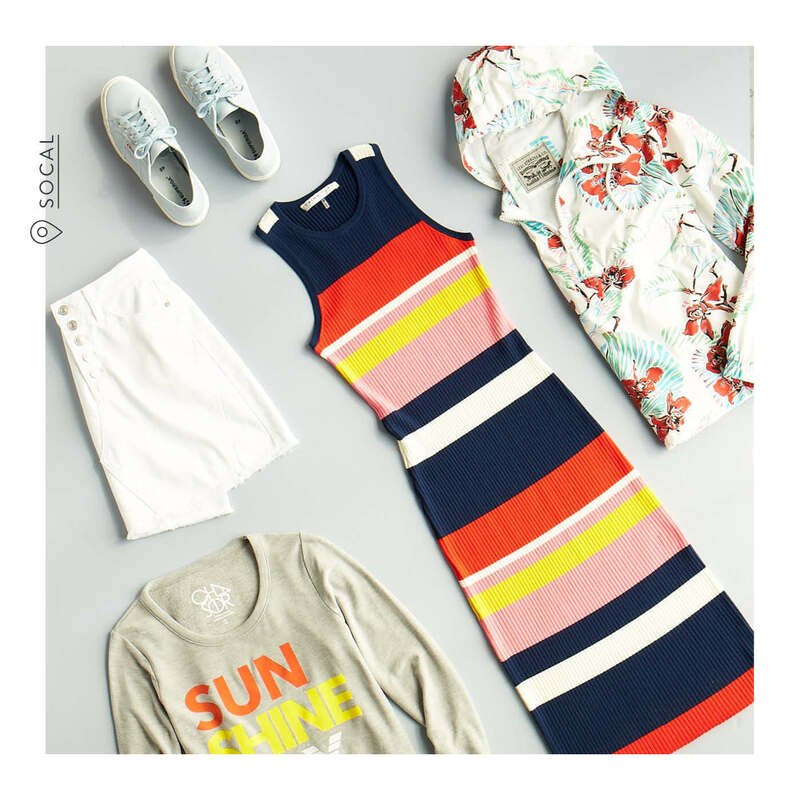 On a warm spring day, I love reaching for an easy striped dress and canvas sneakers for the right balance between polished and laid-back. Sunday brunch is practically an art here and dressing the part of “oh, I just threw this on” is easy with a denim skirt that feels on-trend yet throwback-friendly.” — Stylist, Jan S.
“Austin, my home base, is known for it’s laid back and eclectic western-inspired style, so casual around here is a go-to! When I am going out to dinner with my husband and want something a bit more dressy casual, I throw on my shorts with an off-the-shoulder blouse (colorful or something floral, of course) and a pair of wedges. On those days where we are just grabbing lunch with our little one, I wear them with a casual tee and comfortable sandals. I guess they really are an iconic Texas staple!” — Stylist, Austyn S.
“Minnesotans are masters of making trends work no matter the weather. We have to be—April blizzards are always a possibility. My chambray is the most worn shirt in my closet. It’s my no-fail piece because it strikes just the right balance of laid-back and put-together, and I love to pair it with dark wash denim, flats and statement earrings for an effortless everyday look. However, after a long grey winter, I’m more than ready for vibrant hues, so I might swap in candy-colored skinnies instead. 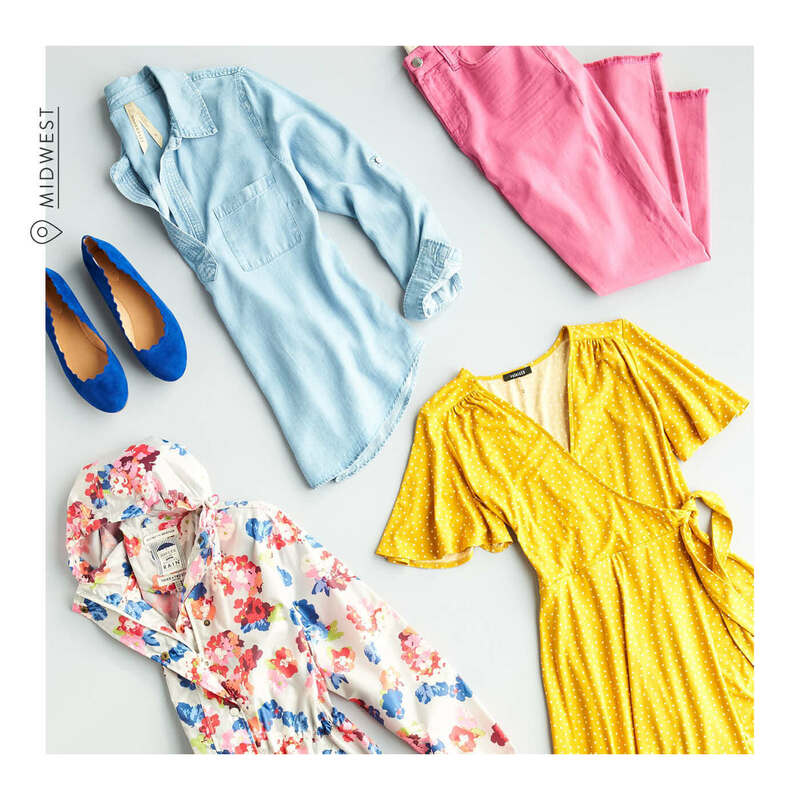 Color is the quickest way to capture a spring feeling.” — Stylist, Tierney C.
“Here in Pittsburgh, we often joke that we can see all 4 seasons in a single 24-hour period. I love creating a capsule wardrobe with some staples that can easily transition from one season to the next. Or, in some cases, from morning to afternoon. A staple in my closet is an elegant sheath dress. The light green hue of this one is perfect for the season, and can be worn for a variety of occasions – at the office, a night in the city seeing a show or even a special occasion like a bridal shower or wedding (hello, Pittsburgh cookie table). Incorporating pops of color into your wardrobe will help it feel fresh and fun. Since the dress is a solid color, I love going for a bolder shoe option. Adding in a print [heel] like this adds a touch of edginess while still staying true to the overall classic look of the ensemble.”— Stylist, Kate S.
Which regional style is most like yours? Tell us in the comments! Want In On A Stylish Secret? 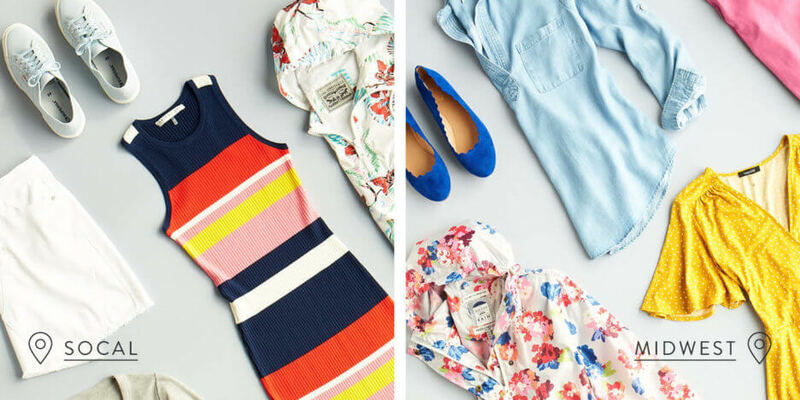 Stitch Fix fashion experts can send you the latest looks to try on at home.